Holidays at the Kelley House! 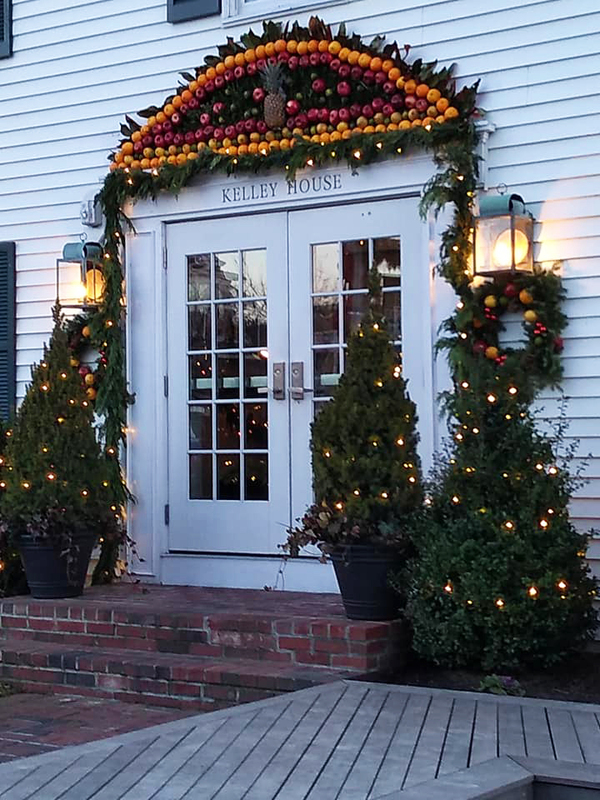 We had the exciting privilege to decorate the Kelly House in Edgartown this holiday season. 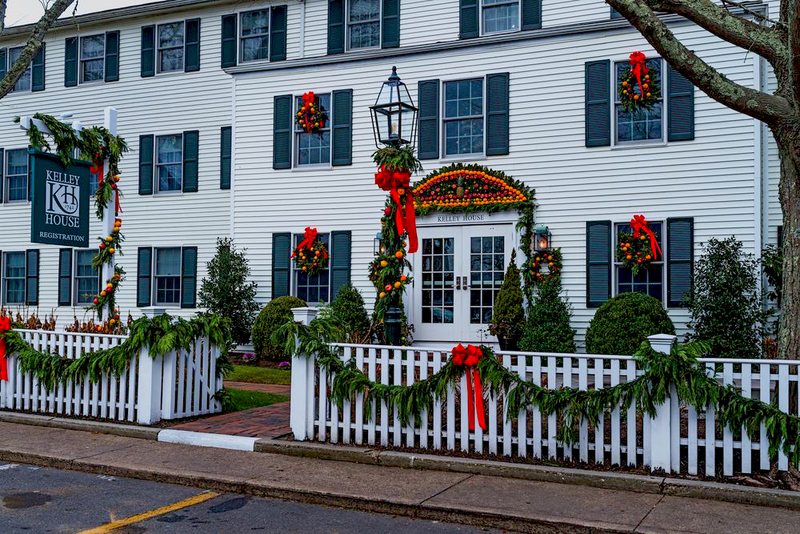 As one of the most iconic hotels on the island, we decide to give a ‘little’ grandeur to the entry and front facade with lush evergreen wreaths, garlands and colorful fruits. 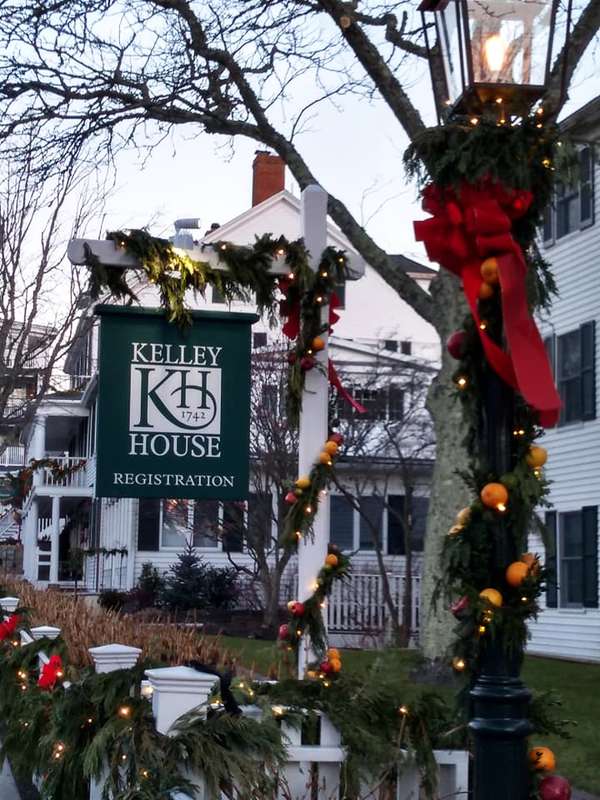 The Kelley House opened its doors in 1742 and is celebrated as one of the oldest hotels in America. As such, we decided to create a historically accurate and exotically endowed fruit façade. These fruits historically were showcased during the holiday season to display a family’s wealth. Families that could afford these exotic pineapples, pomegranates, oranges and apples would include them in garlands, wreaths and as a pediment above entries. It is a lovely tradition that gives a cold and often grey New England a little color back during the holidays. I’m so excited that one of our lovely designs was featured in the January addition of Martha’s Vineyard Magazine. To represent their new life together, Lauren Karp and David Ginsberg crafted their chuppah using wood from their recently purchased Island property. It was accented with cascading purple blooms and a matching canopy. A RELAXED GARDEN PARTY/BACKYARD BARBECUE FEEL, WITH A STRONG EMPHASIS ON FOOD AND MUSIC. It’s no secret that on the Vineyard, August is the busiest time of year. So when Kayla Elliott and Peter Schmidt told friends and family that they settled on a date of August 26 to become husband and wife, everyone was a little surprised. “They kind of thought we were crazy,” said Kayla, who grew up summering on the Vineyard but now lives off-Island while in her third year at the University of Massachusetts Medical School in Worcester. Peter, a speech language pathologist who works with survivors of brain injuries, has long family ties to West Tisbury. Kayla and Peter are skillful planners, but they knew dreaming up the perfect Vineyard wedding required more than just organizational skills. “We started early,” said Kayla. The couple secured a venue, caterer, and rental company for tents, and then hired Plan It Martha’s Vineyard right after getting engaged. Starting the planning process almost a year and a half in advance allowed their guests to book hotels and travel arrangements with relative ease. “We wanted everyone to really experience the Island,” said Kayla. 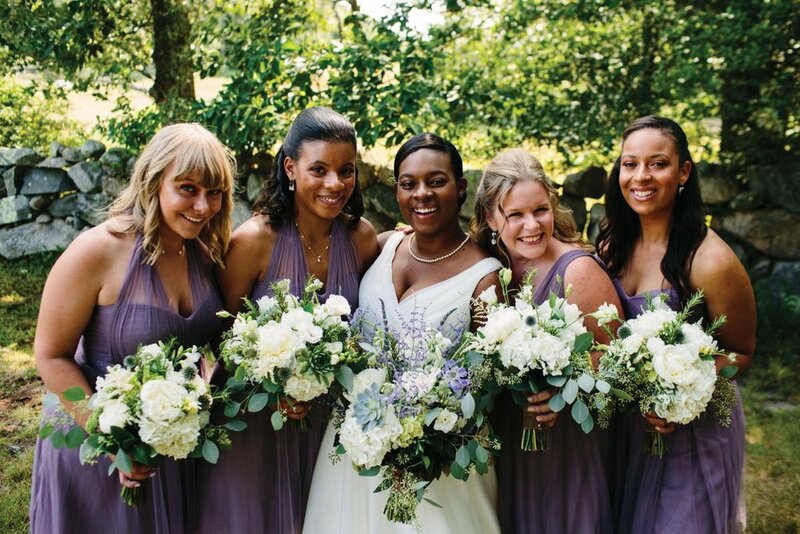 To do that, guests reserved rooms in Oak Bluffs, attended a rehearsal dinner at the Outermost Inn in Aquinnah, and visited West Tisbury for the wedding and reception at a private home. They wanted the reception to have a relaxed garden party/backyard barbecue feel, with a strong emphasis on food and music. Caterers Kitchen Porch and Smoak collaborated to present passed appetizers, a pig roast, and ribs. “The food was universally incredible,” said Kayla. At the end of the night everyone circled back to Oak Bluffs to one of the couple’s favorite spots. “We walked from Summercamp through the Camp Ground, across Circuit Avenue to Back Door Donuts,” said Peter. “It was really a lot of fun. Crowds of people on the street saw us and said 'congratulations,'” remembered Kayla. “That’s something that doesn’t happen year-round." It’s no secret that Aubrey is totally obsessed with flowers. She's constantly uploading her latest arrangements, bouquets and seasonal blooms @aubreymariadesigns see an endless stream of vibrant arrangements that saturate your social screens. Not on Instagram? Then join! Or take a look at her Facebook page where she's long been posting yet another crop of carefree clusterings and novel nosegays. From Martha's Vineyard to Salt Lake City, she shares her work, inspirations and fun moments within her day. Just received a bouquet by Aubrey? Then tag her with #aubreymariadesigns to join the fandom. Feeling so grateful that my beautiful bride Kate Foster and her groom Steve Foster were featured in the newest edition of Southern New England Wedding Magazine! Welcome to Aubrey Maria Designs! When I was a child, my family and I lived on property in small Inns that were located in rural Vermont and ran by my parents. While most children spent their days interacting with neighbors, I spent mine interacting with guests from across the country. This introduction into the Hospitality Industry greatly shaped the person, and the florist, that I am today.